Multi-gyms are those contraptions that look like a bunch of health-club weight machines welded to each other. Many people prefer multi-gyms to free weights or bands because they’re safe and easy to use. Most multi-gyms come with instructions — some even come with videos demonstrating all the different exercises you can do. A basic unit has one 200-pound stack of weight plates in 5- to 10-pound increments. This means only one person can use the machine at a time. A basic multi-gym costs $800 to $3,500. Good high-end brands include Paramount, Pacific, Vectra, and California Gym. For reliable models under $1,000, look at Hoist and Bodyguard. Keep in mind that multi-gyms take up a lot of room — usually more than a stereo wall unit — and most require at least 7 feet of vertical clearance space. Credit: Photograph by Sunstreak Productions, Inc.
Multi-gym weight machines are safe and easy to use. 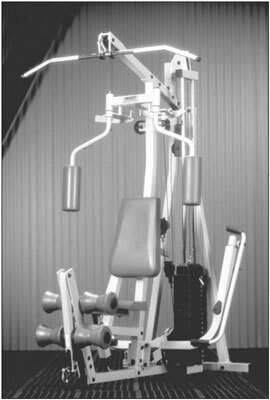 At least the chest/shoulder press, high pulley, low pulley, leg extension, and leg curl exercise stations: Depending on the brand and model, you may also get chest butterfly, chin/dip, leg press, and abdominal board attachments. If these attachments aren’t included with the basic unit, they’re usually available as extra-cost options. Keep in mind that most multi-gyms require you to unsnap and rehook cables or arm positions to switch between exercises; making all those adjustments can add extra minutes to your workout and interrupt the flow of your routine. Free assembly: Pass on any machine that the dealer doesn’t put together for you, especially if it comes with an “easy-to-follow” video on how to build it yourself. Weight stacks that move up and down smoothly: Test several exercises in the store to check for sticking points and levers that don’t allow you to fully straighten your arms and legs. A frame made of thick tubular or rectangular steel: The frame shouldn’t shake or wobble when you lean against it. Also, the frame should be painted or powder-coated to prevent chipping and rusting. Upholstery that’s sewn on securely: If you see corners that are curled at the edges, the upholstery probably will rip, tear, or unravel. The same goes for the rubberized padding around the foot rollers and other small parts. Plates and cables made of quality materials: Avoid materials that look like they’ll snap, fray, or crack. Adjustable seats and arms: If you can adjust the machine, the whole family can work out comfortably. A good warranty: The warranty should cover 10 years for the frame, 1 year for moving parts, and 90 days for upholstery. If you ask before you buy the machine, some dealers will give you an extended warranty at no cost. Don’t buy an extended warranty, however. They tend to be expensive and not worth the money. Take your time shopping for a multi-gym. Many tend to be poorly designed and cheaply made. Try out several different machines, and pay attention to which exercises feel most comfortable.